Some of you have asked about my absence from the pages of this blog over the past nine or so months. I’ve tried to keep an upbeat and somewhat comical tone to my posts, but there’s no way to spin it. 2015 has been tough. What is that old saying, “Life happens when you’re making other plans.” Well, friends, I guess you could say I’ve been living life. 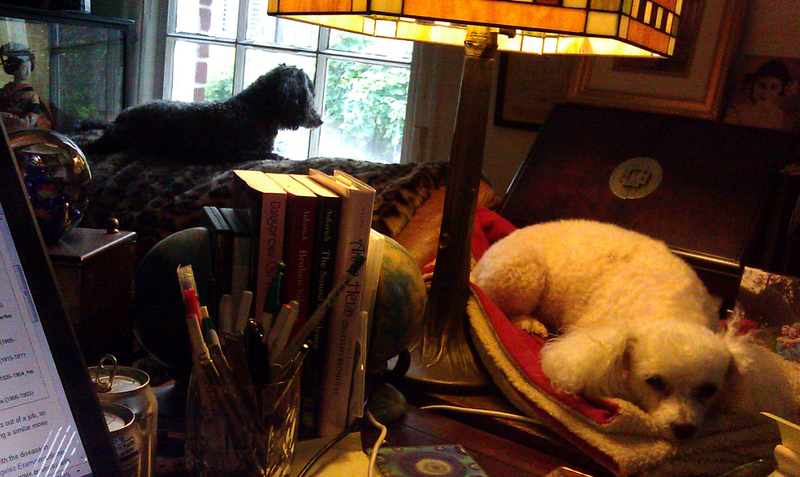 Our New Year’s Eve party was as festive as ever, but something wasn’t right with Maebelle, our 16-year-old poodle. She’d once been the life of our parties, begging to be carried, hugged, and loved. After our parties, I would slow dance with her for the last tune of the evening. Tonight, she seemed to wander and stagger through the forest of high heels. Ms. Taylor, her twin, had long stopped enjoying parties. When she ventured out of her little bed, she went around in circles, blind and deaf. Charle and I picked these little girls when they could lie comfortably in the palm of our hands. For 16 years, through good times and bad, they had been the closest we would ever have to children. Maebelle and I had a connection that went way beyond that of a canine and human. She was almost a soulmate. And so, three days into the new year, Charlie and I arrived at that place where all animal lovers eventually come. That nagging question: Are we keeping these darlings alive for our own pleasure when their quality of life had waned? With Dr. Moshell’s help, our little babies went to sleep in our arms; Maebelle in mine, Ms. Taylor in Charlie’s. For you who have been through this, I don’t have to describe the gut-wrenching grief that comes from deep within your soul. 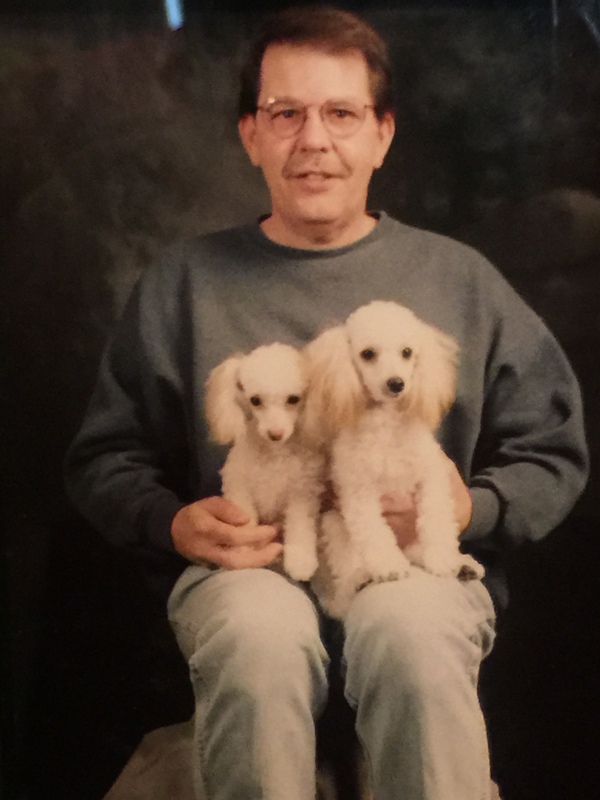 Charlie and I rallied around each other, treasuring Tallulah, our 5-year-old poodle girl. She is black. We call her Tallulah Blackhead. I waited a few days before breaking the news to my mom, who lived across the state. She was Mother Teresa to stray canines and felines in her neighborhood. She understood that strong bond between humans and animals. Mom cried when I told her about her “grandchildren.” “Poor little darlings,” she sobbed. When we left my parent’s house after Christmas a few weeks before, I think Mom knew she would never again see Maebelle and Ms. Taylor. Did she know that morning when she held the puppies tight that none of us would ever again have Christmas with her? Mom knew she was sick; we all did, we just wasn’t ready to go there. Not leukemia exactly, but something called Myelodysplasia Syndrome (MDS), a disease of the bone marrow that destroys the number and quality of blood-forming cells. The doctor was somewhat encouraging. While not a candidate for a bone marrow transplant, Mom could have some quality of life with chemotherapy. That is, weekly chemo treatments for the rest of her life. Mom was a determined fighter. A red-headed hairdresser since the early 1960s, she was one tough 71-year-old. Chemo was the way it went for awhile. Fatigue seemed to be the primary side effect. Then came the fluctuating blood counts: hemoglobin, platelets, red and white blood levels. A monthly blood transfusion boosted her energy level. By Christmas, Mom was clearly suffering from this disease. She’d get out of bed in the morning for a hour or two. Extreme fatigue and pain would send her back to bed, sometimes for the rest of the day. As a family, we’d never been that good at communication, so we all exchanged looks. We talked about Mom’s illness among ourselves. My Dad and me. My Grandmother and me. What’s happening to her? Before we left to come home, Mom called me into her bedroom. She wanted to talk. “I don’t want to die,” she said. “I’ve got to take care of your daddy and momma. I’m going to fight, Michael. 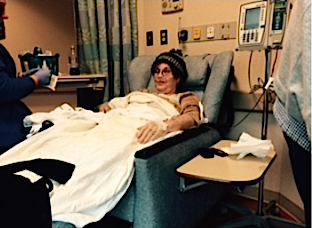 I’m not giving up, but you know I may not make it.” Mom laid out her final wishes. Cremation. A memorial service at the funeral home. An Episcopal service was okay, “but not too many candles and crosses.” For music, she wanted Willie Nelson and Elvis Presley — luckily, their CDs would suffice. And one more question. Would Charlie and I consider taking Pancho, Lucinda, and FiFi, her rescue pups that never left her side? 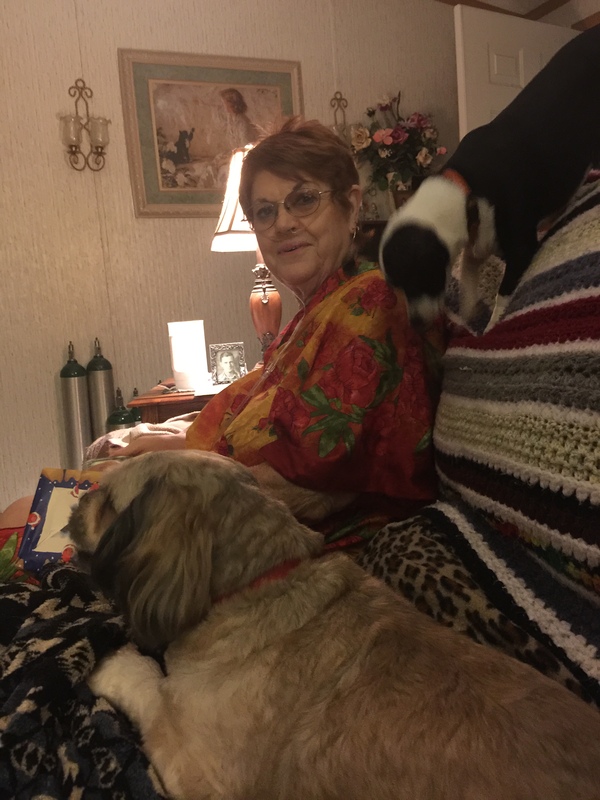 Not surprisingly, Mom’s condition continued worsening into the new year. Despite rain, sleet, or snow, my mom, driven by her saints (Dad, my Aunt, Peggy, and other close friends), made the 30-mile trek to the clinic to have chemo and her blood and platelet transfusions. In mid-March, Mom made the decision to close her beauty shop. Her customers had been loyal and had stuck by her. As hard as she tried, she no longer had the strength to keep going. “Do you want to keep working?” I asked her. Closing her business signaled a new chapter for Mom. She slipped into a depression that never left her. She cried more, became quieter and more withdrawn. In mid-April, a blood blister on her right wrist turned into a wound. The wound turned into a sore, the sore a hole. The flesh inside the sore turned black and smelled of dead flesh. Mom went into hospice on Thursday, April 30. Her family never left her side. Before she slipped into the final coma, I said, “Thanks for being my momma. I love you.” “I love you, too.” she said. “Will you watch over me?” I asked. “Yes” she answered. Charlie and I stayed with her through the night. We talked to her, held her hand. I studied her face as a painter studies his subject, trying to capture in my own mind’s eye the features of that beautiful face that I would soon never see again. 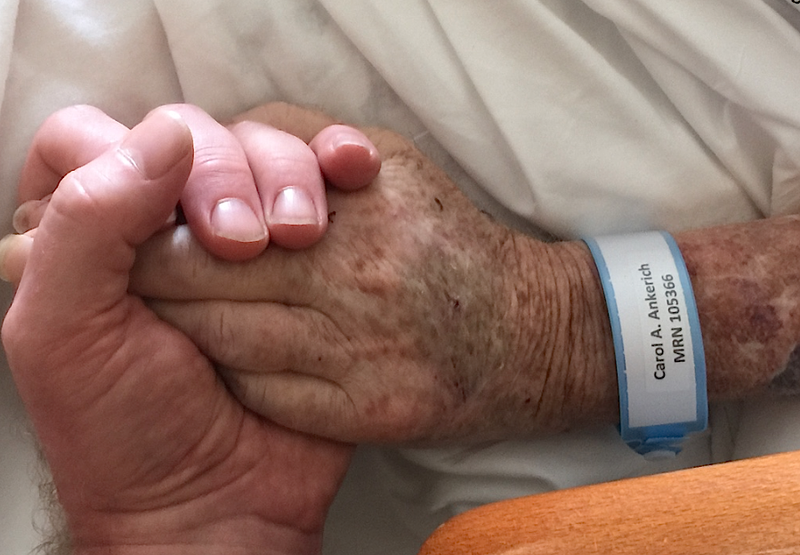 Mom died that morning at 9:50 a.m., May 1, 2015. “Go ahead, Momma, it’s okay,” I cried as she breathed her last. “It’s a beautiful day.” And it was a beautiful spring day. Mom’s suffering was over. Grieving has been hard, my friends. Part of it is wondering how Mom is doing and where she is. The finality of it all is difficult. It’s the phone that never rings, yet I want it to ring with Mom on the other end. Why can’t Mom send a postcard to let me know she made it or send some kind of sign that she is okay. 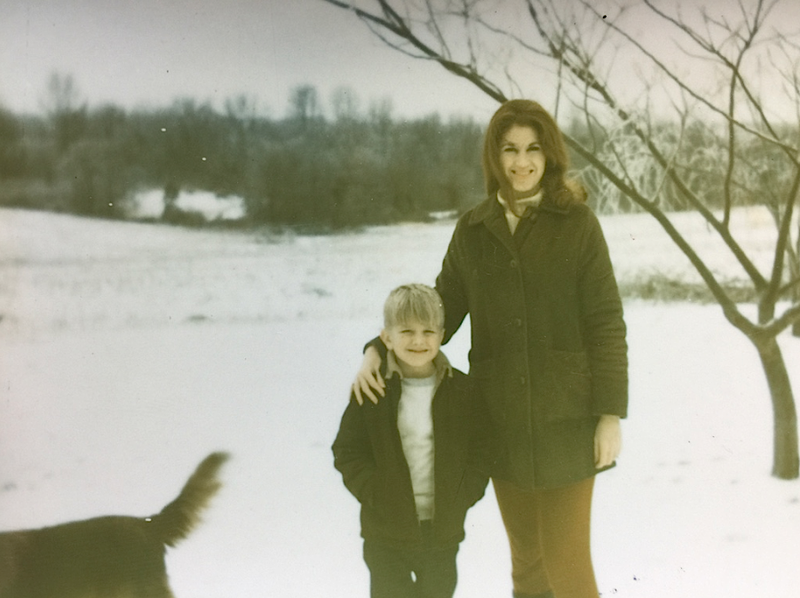 I turned a corner in my grief about three months after Mom’s death. I was lying in the floor somewhere between consciousness and sleep. Suddenly, with my eyes closed, Mom appeared. Her face was a younger Mom. Her voice so familiar. “Michael,” she said. “It’s just the way it is.” Then she was gone. I knew then that I was on a journey through grief, that I was not setting up residence there, that perhaps I would one day see a brighter day and not feel such consuming and overwhelming sadness. As I write this, there is only three months left in 2015. It’s been nine months since Maebelle and Ms. Taylor went to puppy heaven. It’s been five months since Mom left. Life goes on, they say. I am writing again after a long hiatus. My new book, Hairpins and Dead Ends, is coming along. I’m working on new interviews for this blog. People ask me how am I doing. By the grace of God, I am living my 2015 resolution. “I’m surviving,” I say. Mom’s one connection to the silent film era. 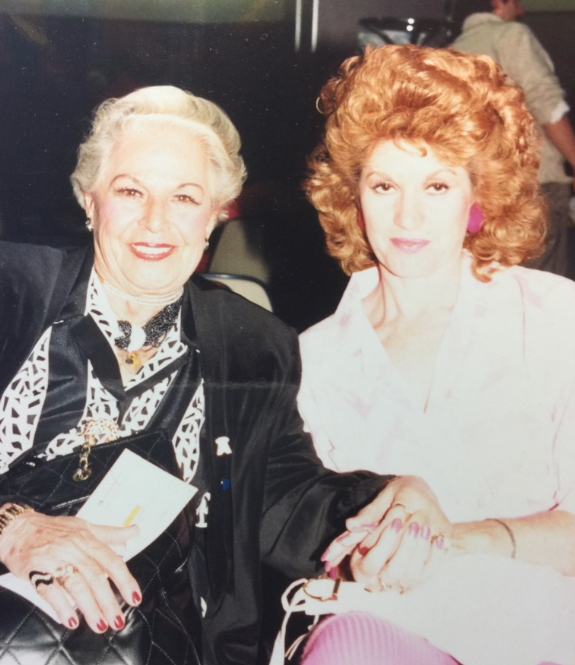 Through me, she knew actress Lina Basquette. Figured you would let us know sooner or later. 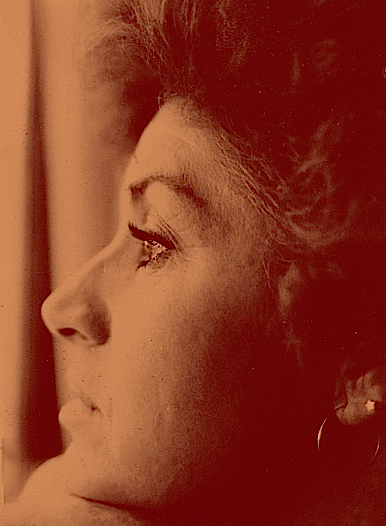 I lost my mother in 2013…she was 99. Due to my own illness I didn’t get to her on her deathbed but several months later an all white bird perched in the tree outside our bay window and stayed there. 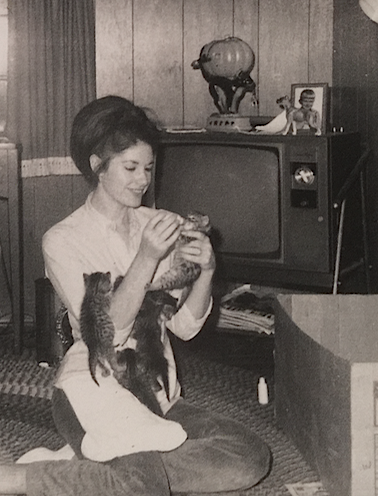 My mother loved birds all her life and I truly believe it was a sign that everything was OK. I haven’t seen that bird since. And four days before Xmas 2014, we had to put down our beautiful Leia, who had attached herself to everyone in the clinic and staff,vet, and owners were sobbing. I take heart that she is at The Rainbow Bridge, waiting for Bill and I. If you haven’t heard of the Bridge read the poem, it will give you comfort. God bless you and Charlie!